Yesterday was Middle K’s 14th birthday, and in the spirit of Waffle Week, we made Chocolate Chip and Blueberry Waffles for breakfast that morning. With some Oven Bacon on the side. For the waffles, I used the One-Bowl Buttermilk Waffle batter. 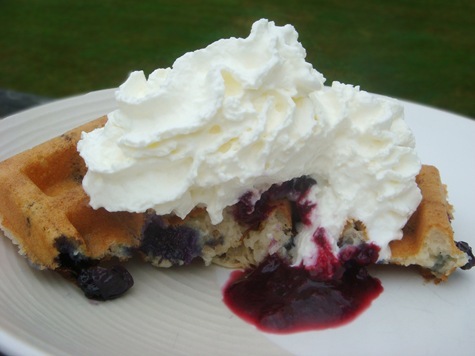 While the batter was in the waffle iron, I sprinkled in mini chocolate chips, or some frozen blueberries (not thawed). Fresh blueberries would obviously be great as well; I can’t wait until summer blueberry season—I am down to my last bag of blueberries that I froze last summer. You could also sprinkle in other berries or chopped fruit (raspberries, chopped strawberries, peaches). Cooking bacon in the oven is a great way to make a lot of bacon without making a mess of your kitchen. And there are NO PANS TO CLEAN WHEN YOU ARE DONE!! It was a great thing to make with these Buttermilk Waffles, as this batter is best if it sits for 30 minutes before cooking. So I made up the batter, set it aside, then got the bacon going in the oven. 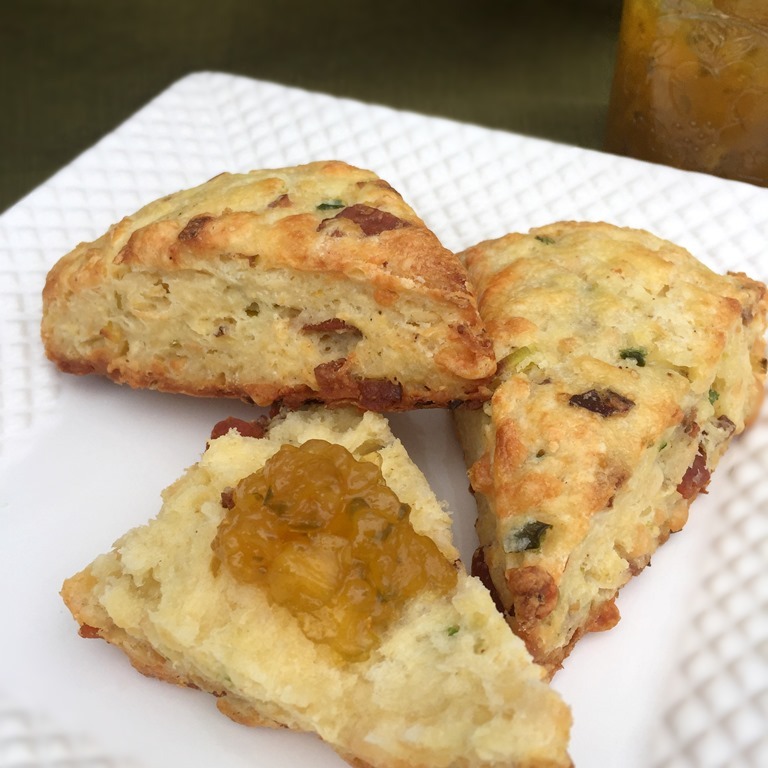 By the time the bacon was crisp, the batter was ready to cook! Simply line a rimmed baking sheet with heavy duty foil, lay out slices of bacon (not touching) and bake at 375°F for 15-20 minutes. Exact time will depend on the thickness of the bacon, and how crispy you like it. A general guideline is to watch the “bubbles” on the bacon. They will start out large, then get small and foamy when the bacon is crisp. Remove the bacon from the pan and allow to drain on some paper towels. When the pan has cooled completely, simply gather up the foil (with all of the messy grease inside) and throw it away. Or you could save some of those bacon drippings and freeze to use for cooking later. Prepare batter according to recipe. 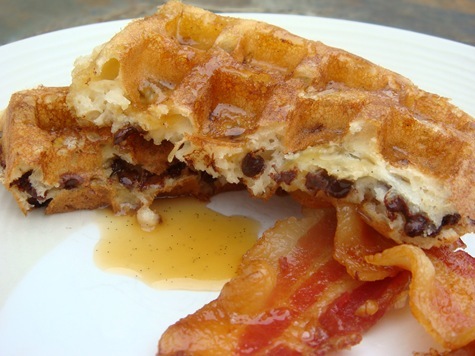 Fill waffle maker with slightly less batter than usual. 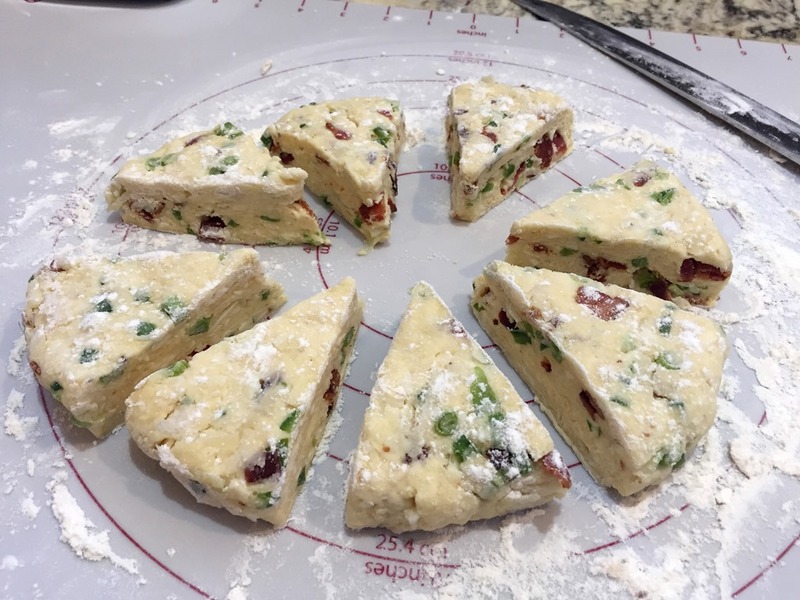 Sprinkle with desired filling. Using a heat safe rubber spatula, gently spread batter in the waffle maker to cover the chocolate chips or fruit with a small amount of batter (so that they don’t stick to the top plate of the waffle iron). Close waffle iron and cook for 3-5 minutes, or until lightly browned and crispy. Line the baking sheet with foil. Lay out slices of raw bacon (not touching) and bake at 375°F for 15-20 minutes. Exact time will depend on the thickness of the bacon, and how crispy you like it. A general guideline is to watch the “bubbles” on the bacon. The bubbles will start out large, then get small and foamy when the bacon is crisp. Remove the bacon from the pan and allow to drain on some paper towels. When the pan has cooled completely, simply gather up the foil (with all of the messy grease inside) and throw it away. Or you could save some of those bacon drippings and freeze to use for cooking later. This side dish comes together really quickly for a great Thanksgiving vegetable. With all of the heavy items on the table: mashed potatoes, gravy, stuffing, sweet potatoes- I like to have a vegetable that is crisp and tender and tastes fresh. These green beans are perfect for that. 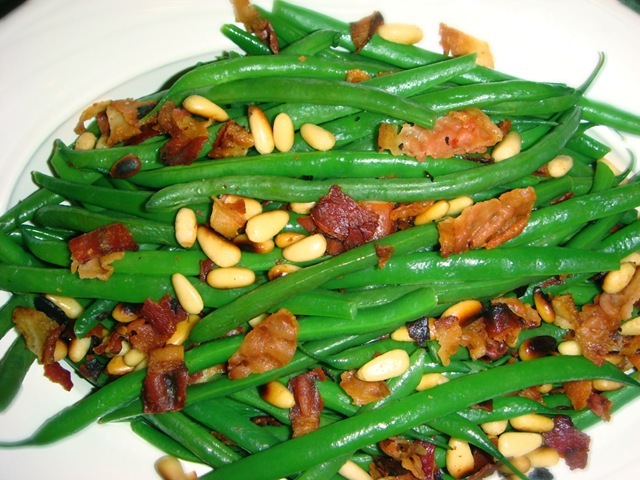 I love to use these skinny French green beans, sometimes called filet beans. They are super tender and very flavorful; not at all stringy. They cook very quickly, less than 5 minutes. Be sure not to overcook, or they will be mushy. 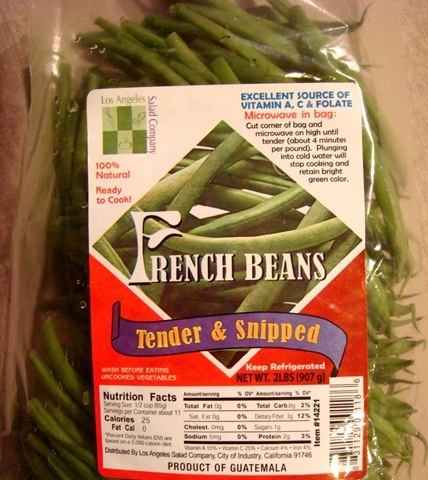 Both Costco and Sam’s Club carry French beans (different brands, however). I think the one below is from Costco. You can also use regular green beans, but I really love these skinny ones. Bonus: they come with the ends already snapped. No advance prep necessary! In a skillet, combine beans and about 1/2 cup water. Add a small amount of salt to the water, if desired. 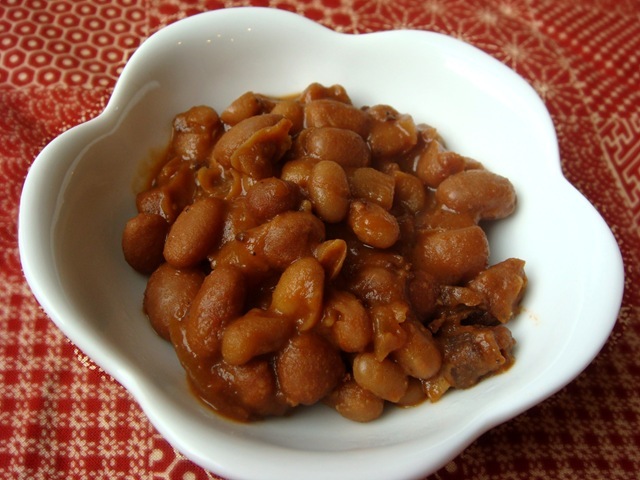 Bring to a boil; cover pan and cook beans for 3-5 minutes, or until beans are crisp-tender. Do not overcook. Drain water and place beans in a serving dish. Cook bacon in the same skillet until almost crisp. Drain excess grease, leaving 1-2 Tbs of drippings. 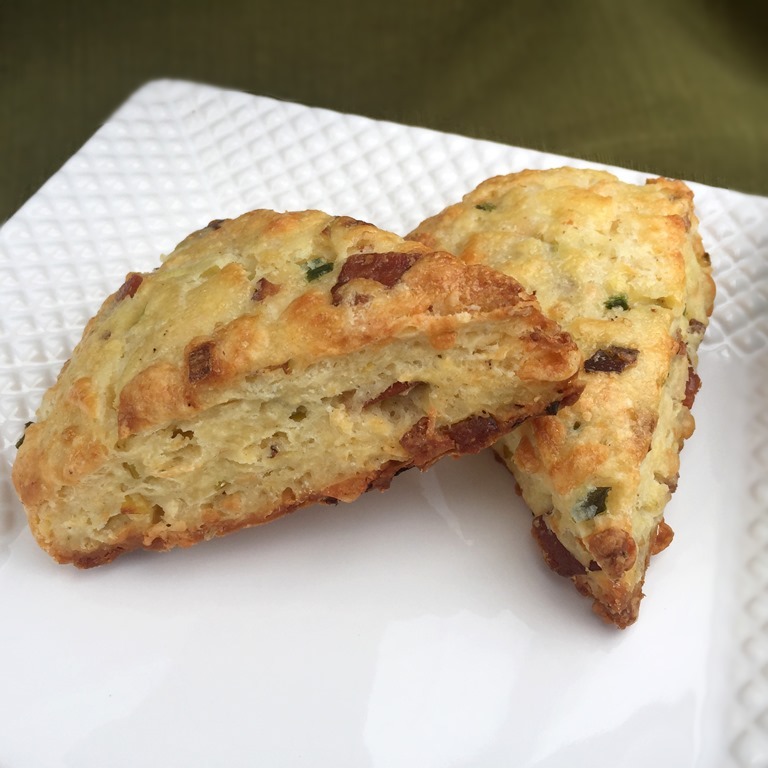 (If you are using precooked bacon, and there are no drippings, add 1-2 Tbs butter to pan). With bacon still in the pan, add pine nuts or almond slices and cook until nuts are lightly toasted (about 2 minutes). Stir in garlic powder, if using. Add green beans back to the pan and stir to combine and warm beans. 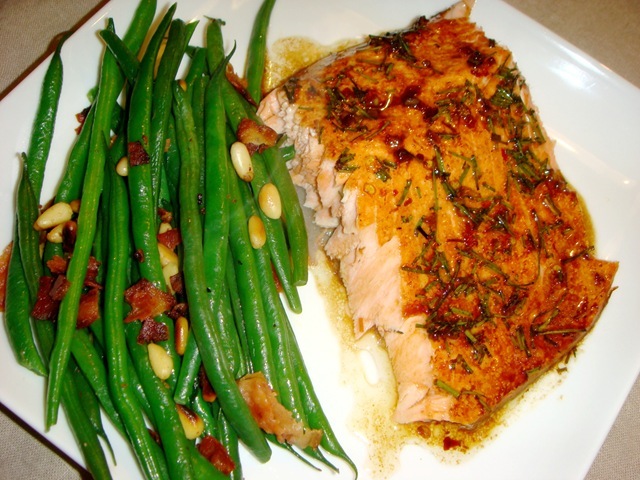 Two of my favorite items from Costco are the large Alaskan (or Copper River later in the summer) salmon fillets and the packages of thin French green beans. 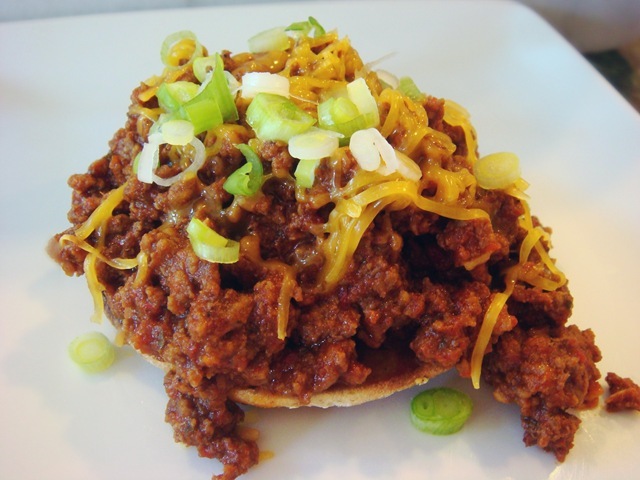 This meal combines both for a quick to prepare, healthy and flavorful dinner.. These large fillets will feed about 4 people. Start by lining a baking dish with non-stick foil (or spray regular foil with non-stick spray). 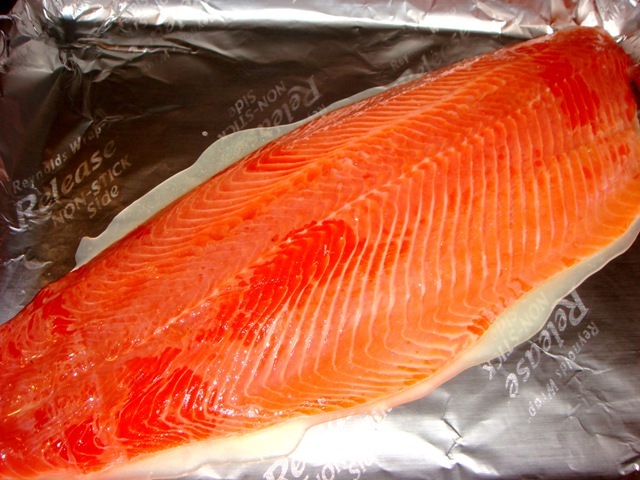 Place salmon fillet in the baking dish, skin side down. Sprinkle salmon with lime juice (lemon would be fine, as well). the salmon before you even put it in the oven. Bake at 425°F for about 15-20 minutes, or until salmon flakes with a fork. Once cooked, the salmon will easily slide off of the skin with a little help from a spatula. Cooking it with the skin helps to keep it nice and moist. Serve salmon with additional sauce on the side (bring reserved marinade to a boil in a small saucepan before serving). 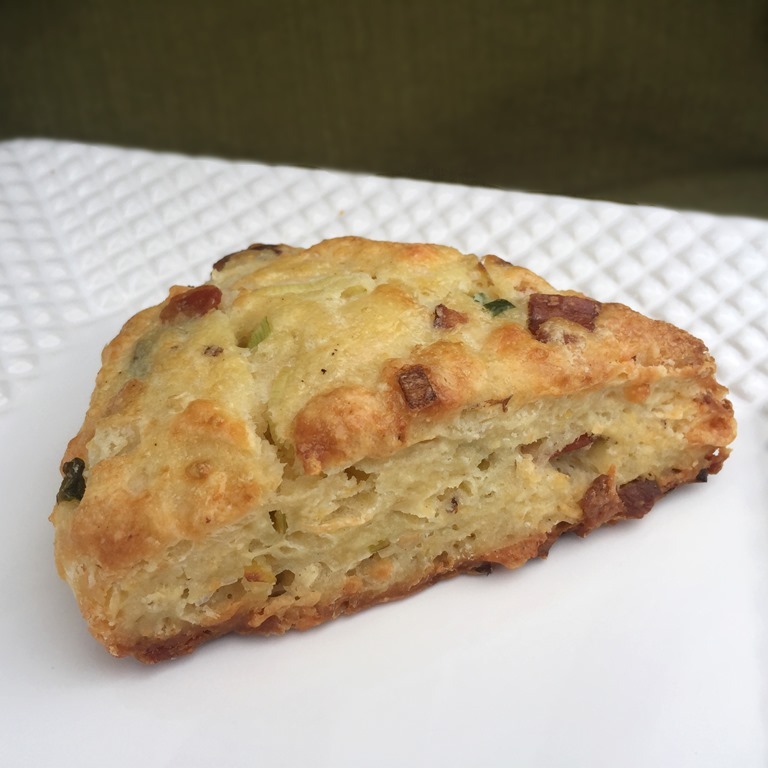 This side dish comes together really quickly, especially if you use another of my favorite Costco items: precooked bacon. I coarsely chop the pre-cooked bacon and cook it in a small skillet with the pine nuts until the nuts are lightly toasted. 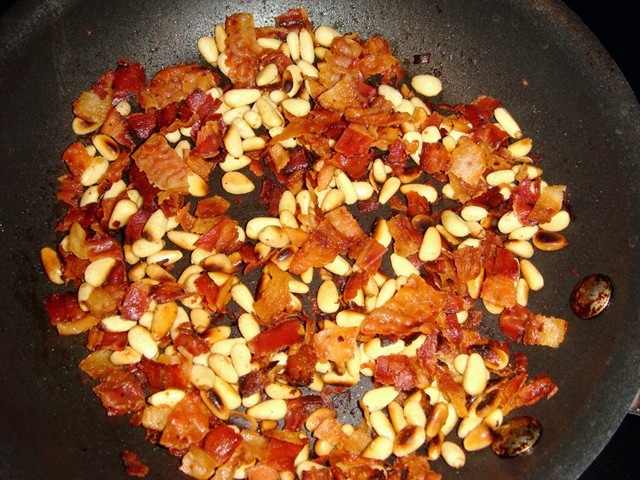 Remove bacon and pine nuts from pan. Add 1 Tbs olive oil (if you are not using precooked bacon, you could just use 1 Tbs of bacon drippings from the pan) and the green beans to the skillet. Cook over high heat for 2-3 minutes, stirring constantly. Add 2 Tbs water to the pan, cover, and cook for about 2-3 minutes, or until beans are crisp-tender. 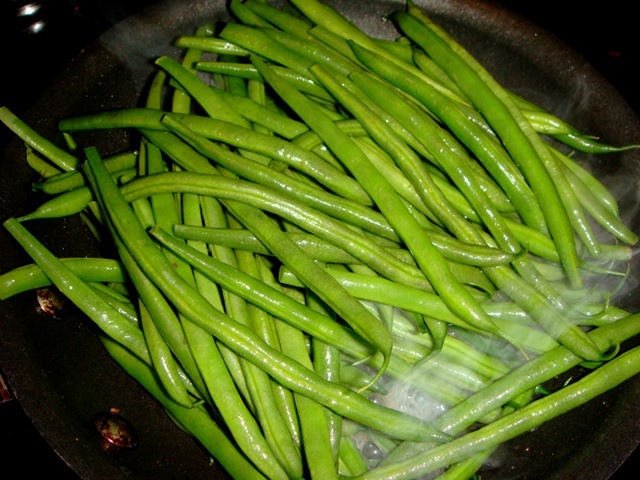 These thin French beans cook very quickly and are very tender. Don’t overcook! Stir in bacon and pine nuts and serve. Line a baking dish with non-stick foil (or spray regular foil with non-stick spray). 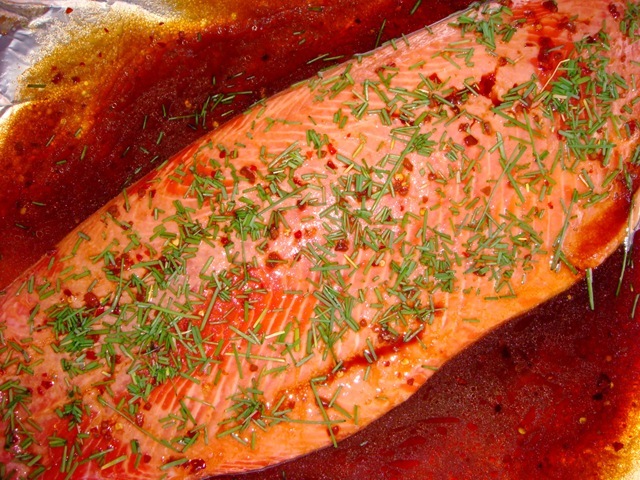 Place salmon fillet in a baking dish, skin side down. Sprinkle salmon with lime juice. In a small bowl, whisk together the olive oil, soy sauce, vinegar, honey, garlic, ginger, red pepper flakes and sesame oil. Pour half of sauce over salmon. Set remaining sauce aside. Sprinkle salmon with chives or green onions. Bake at 425°F for 15-20 minutes, or until cooked through. Fish should flake easily with a fork. Meanwhile, bring reserved sauce to a boil in a small saucepan. Serve over cooked salmon. Cook bacon in a small skillet until almost crisp. Add pine nuts and cook until nuts are lightly toasted. Remove from pan. Drain bacon drippings, leaving 1 Tbs of drippings in the pan. (If you are using precooked bacon, and there are no drippings, add 1 Tbs olive oil to pan). 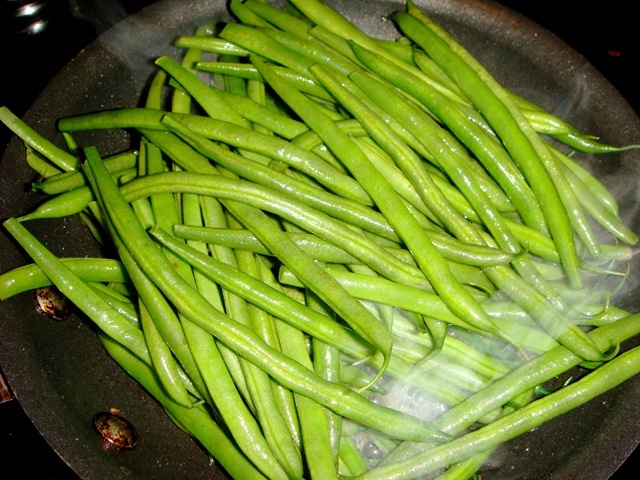 Add green beans to the pan and cook over high heat, stirring constantly, for 2-3 minutes. Add 2 Tbs water to the skillet, cover, and cook for about 2-3 minutes, or until beans are crisp-tender. Do not overcook. Stir bacon and nuts back into beans and serve. 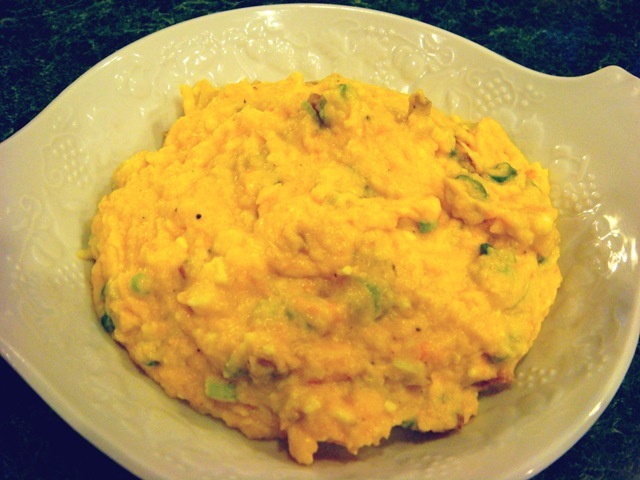 Just a quick post this weekend about a delicious way to prepare winter squash. I am coming to the end of my stockpile of winter squash (procured in the fall at an Amish produce auction-thanks Cynthia!). I have loved being able to go into our “root cellar” – read cold garage- and pick out a good squash for dinner. In this roasted, mashed squash dish, I loved how the mild flavor of a roasted butternut squash was complimented by the stronger taste of gorgonzola. 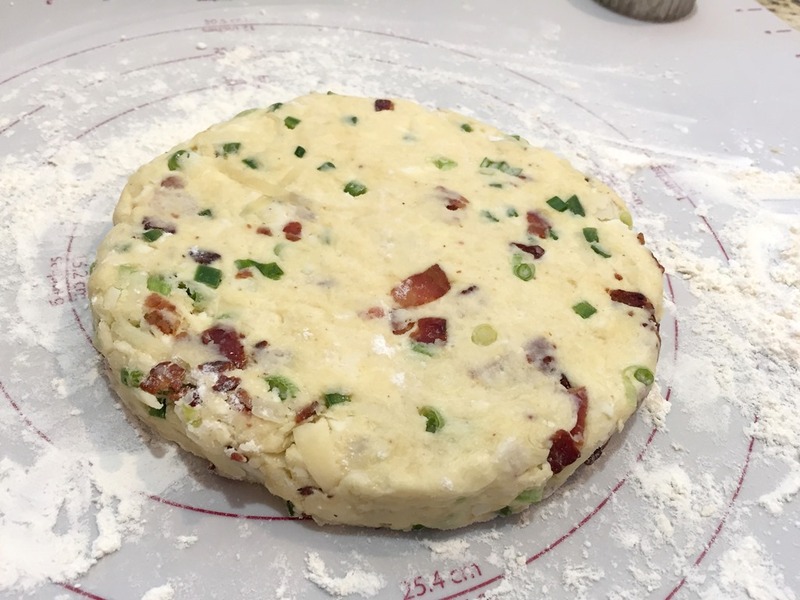 The bacon and green onions make for some great texture. This dish starts with a roasted butternut squash, but you could use any winter squash variety that mashes well (butternut, acorn, delicata, pumpkin; I probably wouldn’t use a spaghetti squash). For a “How to” on roasting squash, read How To Roast Winter Squash. 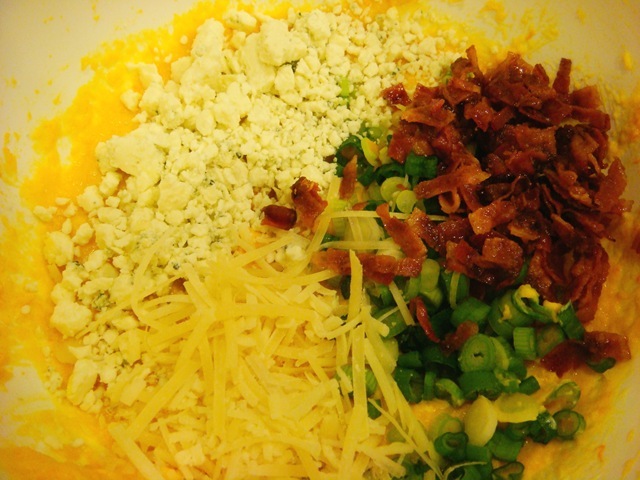 Mix your roasted, mashed squash with some crumbled gorgonzola cheese, cooked & crumbled bacon, sliced green onions and a little Parmesan. The cheeses and bacon made the squash plenty salty to me, but I did add just a little fresh ground pepper. I cooked mine in these cute shallow individual baking dishes that I never seem to have a use for. I only have two (a 20+ year old wedding gift that usually sits high in my cupboard), but knowing that my kids weren’t going to touch this, I got out my stepstool and hauled them down. I divided one butternut squash between the two dishes, and it ended up being more than the two of us could eat as a side dish. It was hearty enough (and very rich) that this amount (with a salad on the side) would have made a perfect main course for two. Bake in a moderate oven until squash is heated through, cheese has melted and edges just begin to brown. Roast squash (see How to Roast Winter Squash). Mash until smooth (an immersion blended works really well). Stir in remaining ingredients. 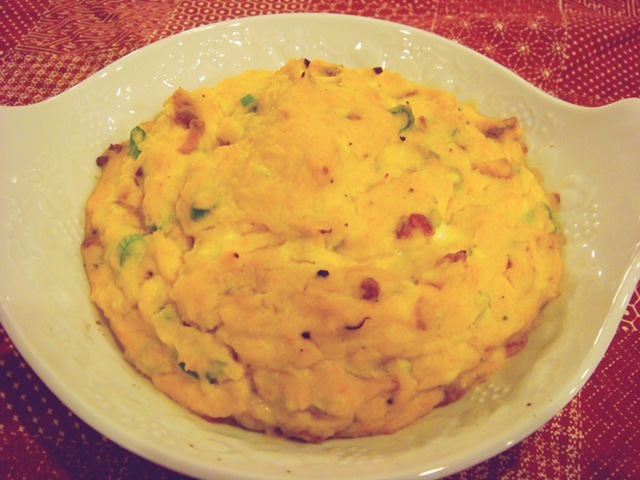 Spoon into individual baking dishes, or one larger dish (about 8×8” or a 1-qt casserole dish). Bake at 375°F for 20-25 minutes, or until squash is heated through, cheese has melted and edges are golden brown.